With a Latino audience in mind, my argument to vote for the 2008 election was backed with humor, exaggeration, and a little bit of emotion. Through hand drawn images and painterly textures, I attempted to author ideas and copyrighting that resonated aided by rhetoric. 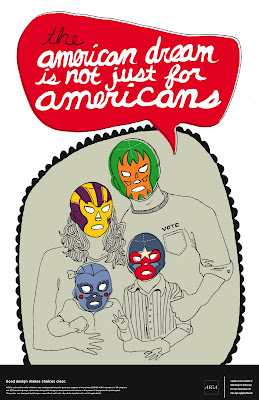 In "American Dream" I used synecdoche to visualize one family for all families and the allegory of the lucha to symbolize their power and confidence culturally. 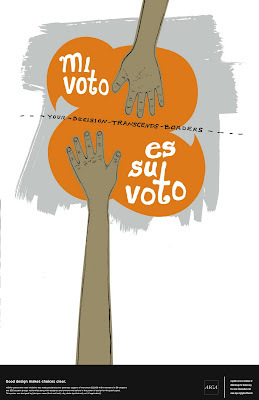 The other poster utilizes hyperpole to exaggerate a reach across nations in an aiding manner with the supporting pun-ful type "Mi Voto Es Su Voto". All formal approaches were made with a humanist approach in mind: are illustrated hands more emotional, does hand-drawn help the humor? Overall, I feel that rhetoric as a tool for deeper lasting impressions is an art and effective when used right.